Whether you’re the parent, grandparent, sibling, teacher, therapist, or second-cousin-twice-removed of a child on the autism spectrum, one thing’s for certain: you understand the relationship between autism and behavioral problems. Now, that’s not to say ALL children with autism experience aggression and explosive tantrums on a daily basis, but communication challenges, sensory processing sensitivities, and an inability to properly express and understand emotions coupled with poor impulse control and self-regulatory strategies can evoke feelings of frustration and anger in even the calmest of individuals. Are you with me here?! And while well-intentioned friends and family members are full of opinions on how to discipline a child with autism, time-outs and consequences aren’t always helpful, nor do they offer a quick and effective solution to parents who are struggling to keep their head above water. The good news is that there are many (many) parents out there who have walked the walk before you have, and the internet is filled with all kinds of tips and tricks not only on how to address autism and behavioral problems, but on how to understand the root of the challenges your child faces so you can prevent undesirable behavior from occurring in the first place. 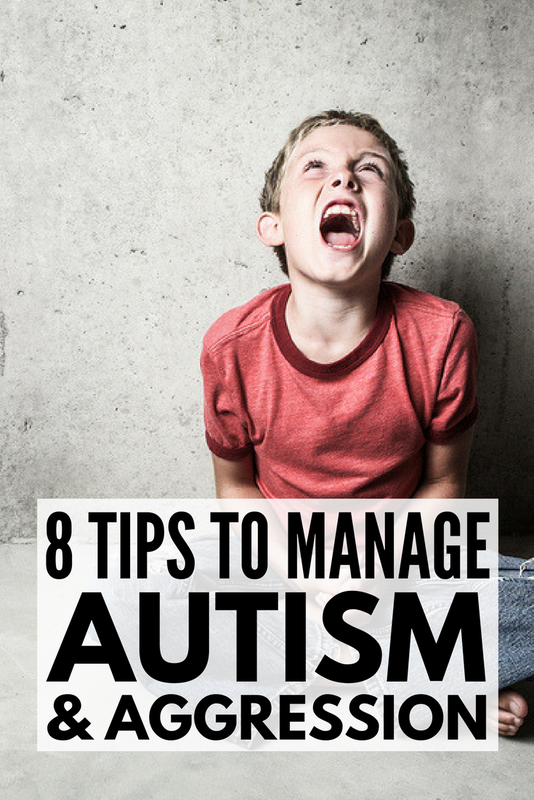 Check out 8 of our best tips to cope with aggression in kids with autism below, and remember: you are not alone. Your child is not the only kid on the autism spectrum who loses control of his emotions and lashes out, and his behavior is not your fault. Your child’s autism is not your fault! You can only control what you can control, and equipping yourself with the knowledge and tools you need to help your child is a fabulous first step. One of the hardest parts of parenting a child with special needs who cannot express his feelings and emotions is knowing WHY things happen. Why is he angry? Why is he crying? Why is he stimming? It can be both heartbreaking and frustrating for a parent to see their child in such distress and not know the reason for his behavior, and when you are already finding it hard to keep your head above water, autistic meltdowns can be downright overwhelming. If this sounds like you, I urge you to take a break. I’m serious. Give yourself permission to take a step back from all of the things that are pulling for your attention each day and make a conscious effort to focus on the bigger picture. Keep a log of your child’s behavior patterns over several days and see if there are any consistencies. Make sure to record things like sleep, diet, bowel movements, changes in routine, sickness, etc. as all of these things can negatively impact behavior. While you are looking for consistencies in your child’s behavior, you will naturally start to find triggers for his anger. For example, you may notice he has more meltdowns and acts more aggressively after a poor night of sleep, when he’s feeling ill, in the face of changes to his routine, or in response to certain sensory stimuli. These triggers may not be immediately apparent to you, but once you start seeing similar patterns of behavior, you can try to work around them. Make sleep a priority, keep him home from school when he’s under the weather, use visuals schedules and prepare him for changes in routine, and find ways to manage sensory overload. From managing impulsive behavior, resisting distractions, and learning the art of delayed gratification, to regulating emotions in the face of conflict and feelings of discomfort, self-regulatory behavior is key to success in all areas of our lives, and since children with poor self-control tend to exhibit more behavioral problems than their self-disciplined peers, teaching children how to self-regulate is more important than parents might think. There is a lot of literature linking autism and behavioral problems to diet, and a lot of parents of children with autism spectrum disorder favor the GAPS diet. Inspired by The Specific Carbohydrate Diet (SCD) and develop by Dr. Natasha Campbell-McBride, GAPS stands for Gut and Psychology Syndrome and is intended to remove gut-damaging foods that are difficult to digest and replace them with nutrient-dense foods in order to allow the intestinal lining to heal and seal. If you’re interested in pursuing the GAPS diet for your child, I urge you to do your due diligence first. Read about it online, discuss it with your child’s doctor, and enlist the help of a trained naturopath, and if you feel it’s the right avenue to take, check out our favorite GAPS recipes HERE. Reinforcement is a fabulous technique parents and caregivers can use to increase the likelihood that a child will repeat a desirable behavior rather than an undesirable one, and while both positive and negative forms of reinforcement can be beneficial in terms of regulating emotions and behavior, research tends to suggest that positive reinforcement is the most effective. Behavior charts and reward charts can be fabulous motivators when used correctly. Created by Carol Gray, Social Stories are written descriptions of everyday situations and events told from a child’s perspective. The intention behind Social Stories is to give a child something to rehearse so he’s prepared once the situation described actually takes place. This can be an excellent strategy to encourage appropriate behavior at school and within the community. Here are 21 templates and apps to help you easily write a Social Story for your child. While the introduction of iPads has certainly helped children and adults on the autism spectrum, we live in a day and age where our children are spending hours upon hours in front of their smartphones, tablets, computers, and video games, and integrative child psychiatrist Dr. Victoria Dunckley has found that an ‘electronic fast’ can improve mood, focus, sleep, and behavior. Her book, Reset Your Child’s Brain: A Four-Week Plan to End Meltdowns, Raise Grades, and Boost Social Skills by Reversing the Effects of Electronic Screen-Time, provides an interesting take on the impact electronic devices can have on our children, and if your child is spending umpteen hours on his iPad each day, there is enough online literature to support the claims that interactive screen time can be more harmful than helpful. Perhaps a 4-week electronic fast is in order? If I can leave you with one last piece of advice, it’s this: it’s okay to ask for help. I’m serious. As much as we want to be everything to everyone, sometimes the best thing we can do for our children and ourselves is to relinquish our control and accept the assistance of others. ABA Therapy (Applied Behavior Analysis) and IBI Therapy (Intensive Behavioral Intervention) can do wonders in improving autism and behavioral problems, and most countries offer some sort of respite care for the families of individuals with developmental disabilities like autism. Autism and behavioral problems can be all-consuming for parents and caregivers, and while identifying and avoiding triggers, teaching self-regulatory skills, making dietary changes, and removing electronic devices can certainly help with a child’s aggressive behavior, sometimes we need to be the change we want to see in the world. You’ve probably heard the infamous ‘put your own mask on first before helping others’ analogy as it relates to parenting and self-care. Originally coined from the safety instructions used on commercial airlines, the idea is pretty simple: you need to take care of yourself before you can take care of others. And if you think about it, it makes total sense! Children pick up on our moods, and if we’re living in a constant state of stress and anxiety, how can we expect them to behave any differently? By ensuring you are at your best, both physically and emotionally, you are giving your child the most important gift you can give her: YOU. If you these tips to cope with autism and behavioral problems helpful, please share this post on Pinterest! And if you’re looking for more advice relating to autism and other developmental disabilities, please follow our Autism board where we share all kinds of helpful tips and trick.